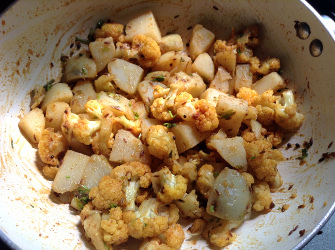 This Potato cauliflower aloo gobi subji recipe is a easy and quick cooking Indian vegetable side dish. 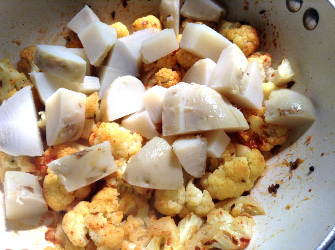 This is a North Indian way of cooking aloo gobi subji. 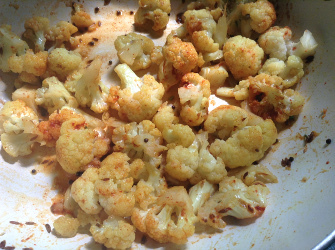 Cauliflower is also known as phoolgobi / gobi (Hindi), hookosu (Kannada) etc. You can serve it with chapati, paratha, naan or with plain rice. It is best served hot but cooled one tastes good too. It will keep in the fridge for 3 days. Just reheat before serving. It is a good one to take for lunch to office or school with chapati / phulka. The ingredients for this aloo gobi subji are few and it gets ready in less than 15 minutes. The quantity of potato as well as cauliflower can vary according to your choice and availability. Removing potato skins or not is your choice. You may remove the potato skins if you wish with a peeler. If you have boiled potatoes ready, you may use them and the cooking time will be reduced further. Today I am using boiled potatoes as I had them ready. This is a dryish subji. So a good accompaniment to take in your lunch box. You can make a wrap / roll with chapati. 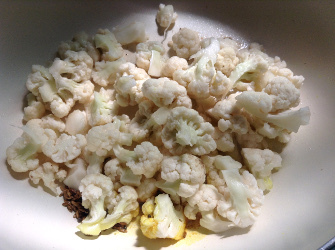 Go to How to clean and prepare cauliflower before cooking for cleaning cauliflower instructions. Cut and Keep the gobi and potatoes pieces in two separate bowls of water. 1. Heated a pan and added vegetable oil. When it is hot, added mustard seeds and cumin seeds. Let them crackle. Added hing (asafetida) and turmeric powder. 2. If you are using raw potatoes, add them to the tempering. Cover and let potatoes cook a little. If using boiled potatoes, skip this step. I am using boiled potatoes today. So I added cauliflower florets first to tempering oil. 3. Sprinkle a little water (about one tsp). Covered and cooked for 2 minutes. 4. Added chili powder, jaggery / sugar(if adding) and salt. Mix well. If it looks too dry, add 1 spoon of water. 5. Added boiled potato pieces. Mix, cover and let cook for 2 minutes. 6. Added garam masala, dhania/ jeera powder, amchoor powder (if adding), coriander leaves. Mix well and cover. 7. Cover and cook for 2-3 minutes. Check if potato and gobi are cooked to your liking. Cook some more if necessary. 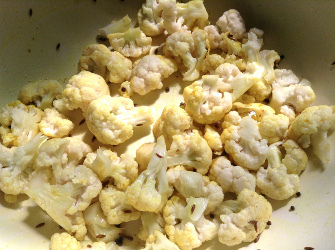 Do not let cauliflower / gobi get too soft. Add coriander leaves. Mix well. 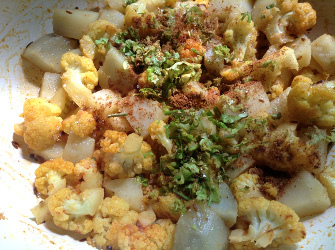 Aloo gobi subji is ready. If you are using boiled potatoes, add cut cauliflowers in the pan first. When they are cooked, add boiled and cut potatoes and all the other spices etc. Cleaning cauliflower before using is necessary. Cauliflower may have some dirt or insects. So to clean cauliflower properly, add the florets to hot / warm salt water. Cover and let it sit for 10-15 minutes. 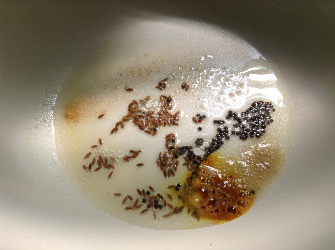 Remove from water and wash in a colander under running water.